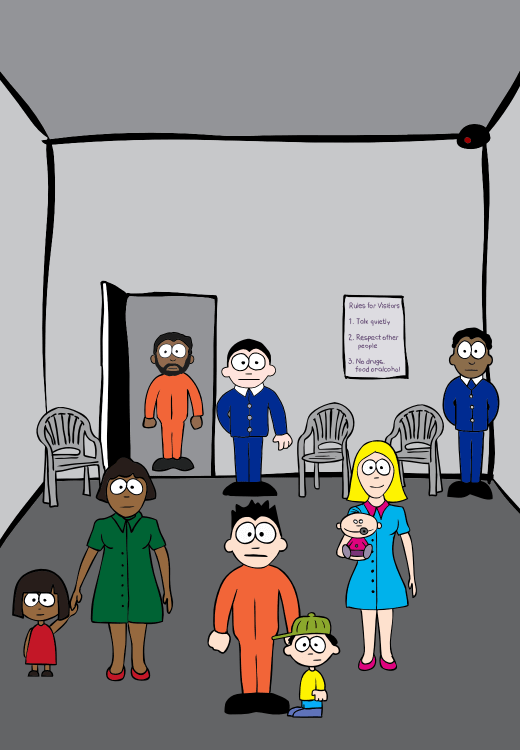 Here’s an easy to understand picture that shows you what you see when you go to visit your parent inside a prison. The things are explained underneath. May be wearing orange overalls. You can hug them unless they are on a “booth visit” and then you can’t. They make sure everyone is safe and can hear. If you are too noisy they might ask you to leave. All visitors are locked in when they visit. but they are all let out afterwards. There may be other people when you visit, and it may be crowded and noisy in the visiting room. The baby can take a bottle into the prison. But other people can’t take any food or drink when they visit. You can’t take anything into the visiting room to show your parent because things are not allowed to be brought into a prison.